Last year I bought cases of cases of the most delicious Roma tomatoes, all summer. I was so happy to make my own sun-dried tomatoes, rosemary basil sun-dried tomatoes, oven roasted tomato sauce and finally my own tomato paste. These recipes are perfect for storing and using throughout the winter and I am so excited to share this incredibly easy tomato paste with you. So you can enjoy yours through the winter too. 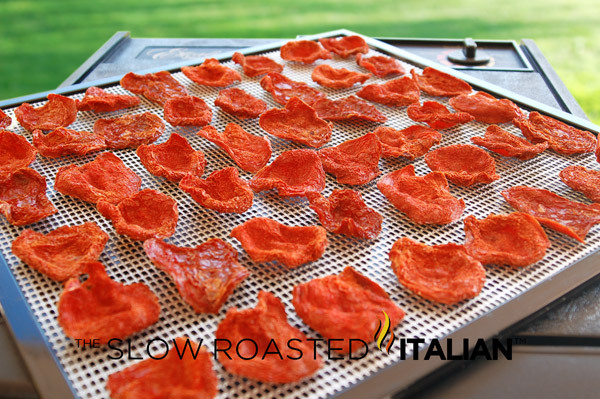 Ever wanted to make Sun-dried Tomatoes at home, preservative free and delicious. Make these in your oven OR dehydrator. Make the best tomato sauce ever with fresh tomatoes. 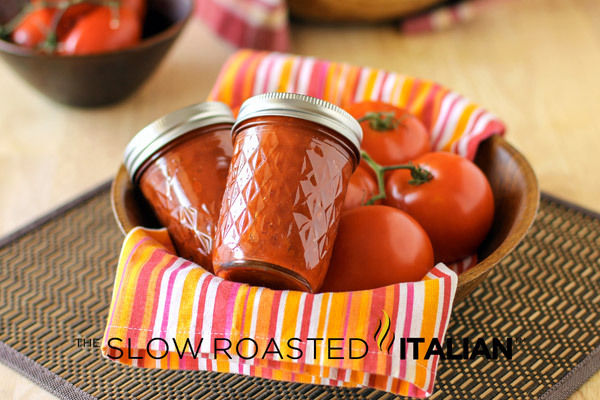 Oven Roasted Tomato Sauce gives you that deep tomato flavor that you are looking for. Prepare an ice bath; fill a large bowl ice and adding water to start ice cubes melting. Place in sink. Bring an 8 quart stock pot filled with water to a boil over high heat. Add about 8 tomatoes to water at a time and boil for 30-60 seconds. Carefully remove with a slotted spoon or sieve and place in ice bath. Repeat until all tomatoes have been blanched. Peel skin from tomatoes, cut out core and bruised spots. Cut in half and set aside. With clean hands squeeze tomatoes over a bowl and remove seeds and excess water. Place into a strainer over the sink, as tomatoes will continue to drain. Add tomatoes to blender. Blend until pureed. Pour into crock pot. Add peppers, bay leaves, salt, and garlic. Cook on low for 8 hours, or until thick. Stir every hour. You can also cook this on high, but it will need to be stirred every 15-20 minutes. Once tomatoes are thick, you can remove from heat and allow to cool. Transfer to freezer safe containers or to canning jars. This tomato paste can also be canned (check your manufacturers instructions for details). I know you will enjoy this for months to come! Sounds like a great recipe. Thanks Donna. The lack of added acid would make this recipe rather iffy for water bath canning, unless you're certain of the acidity of your tomatoes. anyway to simplify this for a pound of spaghetti? I would not serve tomato paste with spaghetti. It is very concentrated and great to use in skillets that you need more tomato flavor and it also helps thicken your sauces. oh I use paste all the time in a Bolognese sauce. And you thin it with a little bit of Evaporated Fat Free Milk. Likewise for sauce, you can easily thin the paste with chicken stock, or beef stock, or even vegetable stock, I like bold Tomato flavors. So 1 cup paste, freeze the rest, and two cups of stock, in a slow cooker with basil, onion, and like Marcella Hazan does just a wee bit of butter. Also an onion cut in half around the middle, will sweeten the sauce. Donna....am I putting the peppers, salt and garlic in the blender also? And then just the bay leaf into the crockpot? I didn't know if the peppers would cook down enough if they didn't go into the blender. You can either dice the peppers or puree them. I just chopped them and they cooked down. Hope that helps! Enjoy. Just came across this recipe looking for a homemade tomato paste recipe. I was wondering if you cover the crockpot or not. Thanks! Hi Wendy! Thanks for leaving a comment. We do NOT cover the crock pot, you are reducing your tomatoes, so you want to the the moisture escape. Hope that helps. Enjoy and let us know how it goes. I was wondering if you cover the crock pot or not. Thanks! Looks yummy.